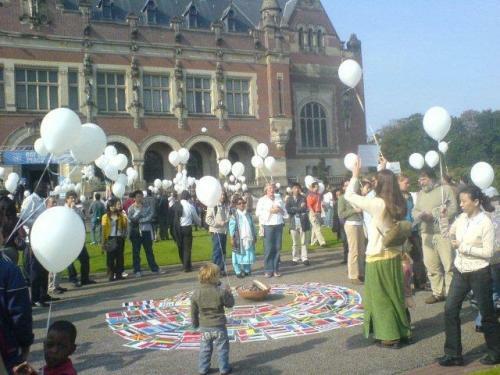 Every year on the International Day of Peace we conduct a vigil ceremony in front of the Peace Palace in The Hague. There we are permitted to burn the seventh fire, a ceremonial fire that is burning to help humanity to transform it's culture into a culture of peace. Our first ceremony there was on Ascencionday 1999, during the Hague Appeal for Peace, and we have been working there ever since, to meditate and concentrate on the well functioning of the institutions humanity has created to establish international law, needed to solve conflicts non-violentely. we have seen the festivities on 21 september grow immensely, that for sure. Not really an obstacle, but what I do not understand that big organisations started celebrating 21st of september, changing the name (peace day, peace planet) and were not really willing to melt al the festivities into one big celebration. I think this is a bit the Dutch disease: everybody wants to do things together, but all under their own name. silence for peace had a commitment to celebrate the 21st of september at the foor of the peace palace. I do not know where 2011 will find us..
To be honest, I have become very huble in this. Allthough I would love to have ideas about this, I am afraid that we need more disasters to wake us up, because allhough within the movement progresses are made, on world level it is still the neo kapitalistic movement that is gaining controll. But I am full mof hope, because we do what we can, and I know unexpected help WILL come. Peace WILL prevail on Earth, because that is what it is there for.